All of the types of electromagnetic frequencies shown above radiate their energy outward, which is why they can all be classified as “radiation.” You may already be familiar with X-rays, and ultra violet light, which are types of radiation. 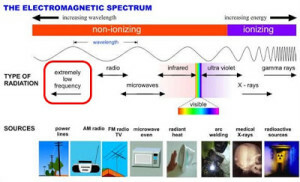 Even visible light is a type of radiation, because it travels in the form of rays and waves, emitted by a light bulb. However, we know well that light isn’t dangerous to humans, so that tells us that not all radiation is a concern. Cell phones are found in the RF, or radio frequency range. The extremely low frequency end, which is what the laptop and all other electrical devices emit, is the portion of the spectrum HARApad aims to protect the user against. This means that the HARApad will not keep you safe from RF signals, nor will it block UV or X-rays. Imagine it this way: you use sunscreen to block UV rays, and a lead apron to block X-rays. You wouldn’t expect sunscreen to keep you safe from X-rays, and likewise, the HARApad will only keep you safe from the ELF range of the electromagnetic spectrum. That being said, it is impossible for a device to protect a person from radio frequencies. Since they are emitted in all directions from a central antenna, they fill the air around us. One would have to wear an entire suit in order to remain isolated from RF signals. We are immersed in these signals any time a cell phone can get reception. On the other hand, the ELF range is emitted by electrical devices, and remains contained in a field immediately surrounding that electrical device. As a person’s distance from the device is increased, the ELF field becomes weaker, eventually to zero. Imagine this as needing to be closer to a WiFi router to get a stronger signal. However, it is when we use electrical devices directly on our bodies that creates a concern for danger. There has long been a concern surrounding electric blankets, and it is for this very reason that the concern exists. Electricity flows through the blanket, and we use the blanket directly on our bodies. When we do that, the ELF field is subjected directly onto our bodies, when it needs distance in order to dissipate to zero. Laptops pose the exact same concern. There are many, many types of radiation, and it is important to know which pose a threat, and which do not. It is important to know what type of device you are purchasing, and what it is protecting you against. Please feel free to post any questions as comments on this blog, and we at HARApad will clear up this at-times confusing topic.